The spread offense is a great way to spread the defense out horizontally, while creating natural running lanes inside. Spreading the defense out will allow the play caller to see where he out flanks and outnumbers the defense. 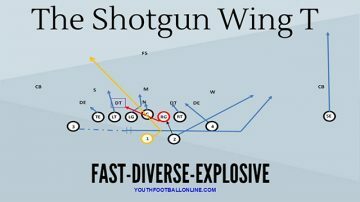 Youth football defenses will either adjust to the spread formation leaving a soft box, or they will not respect the spread and keep defenders in the box. If they spread out with the formation the inside can be attacked. If they do not spread their defense out to the spread look then you can hit the defense outside. Good play calling in the spread offense depends entirely on calling the right play vs the defensive look you are getting. Bubble/Smoke/Tunnel and Slip screens. Flare passes to the wing back or running back will work nicely as well. The flare or swing pass is an excellent way to get your athletes the ball in the open field. Play action (fake run inside, throw pass route outside). If they are giving you a load box, they are playing run. Hit them with the pass play when they are selling out for run. Misdirection makes the defense hold gaps and not pursue to the ball because of the fakes. Make the defenders look, rather than just react. QB sweeps! Quarterback sweeps are great ways to drive defensive coordinators nuts. Utilize those athletes at QB. Screens, Jet/Rocket/Fly sweep, play action, and quick misdirection will kill the blitz and loaded boxes. In youth football motion and screens are always very successful. Post or skinny post pattern. The number one thing to do when the defense is matching numbers (players) inside and outside of the box is to see where the blocking angles are in your favor. Look for easy blocking angles and flanks on the defense. A good defensive coach will have his team aligned properly. When this happens you have to see where you have the player advantage. Player advantage means: if the defender covering your slot is not as good as your slot player then take advantage of that. Take advantage by having your better slot player block or beat the defender on a passing route. Scouting is also very important. Scouting will allow you to discover their tendencies and will allow you to know where their weakest link is. Also, have a coach watch the other team’s defense to see if they are shooting inside or outside. If you see the defense is doing a lot of stunts and slants take advantage of that. If they are slanting inside, call a power play or something outside. Defenses that slant will sometimes take themselves right out of the play. Scout and have the coaches watch the opposing defense to see what they are doing. It does not make sense to just call plays. Play calling in the spread offense has to be based on the defensive alignment and reaction. I feel the no huddle is a must for all spread teams. This will allow the offense to call a play that will hurt the defense. The no huddle is a must for successful play calling in the spread offense. The no huddle lets the defense pick the way they will get beat. There are many benefits of a no huddle offense, and yes it can be used in youth football.